When I visit a cemetery, I am often struck by a particular stone I find. It might be an interesting quote, a somewhat fancy stone, a name that is vaguely familiar, or nothing in particular at all. This happened at Beech Springs Methodist Church Cemetery in Bullard, Twiggs County, Georgia. 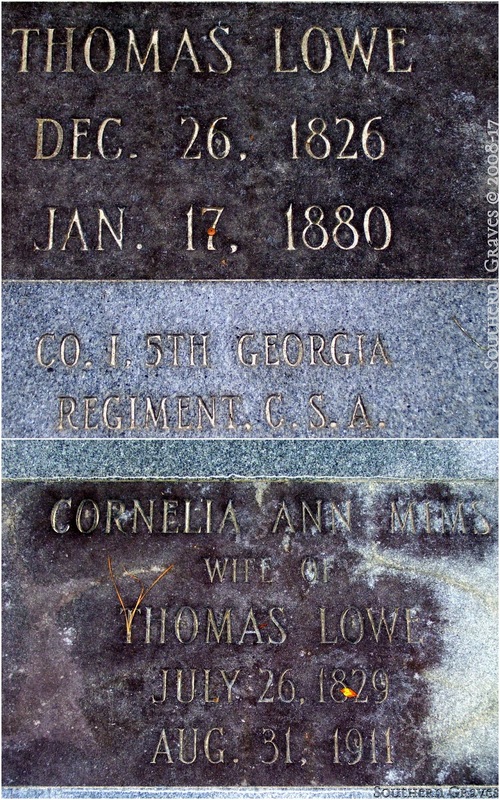 Thomas Lowe and his wife Cornelia Ann Mims piqued my interest. The following is what I found out about them. 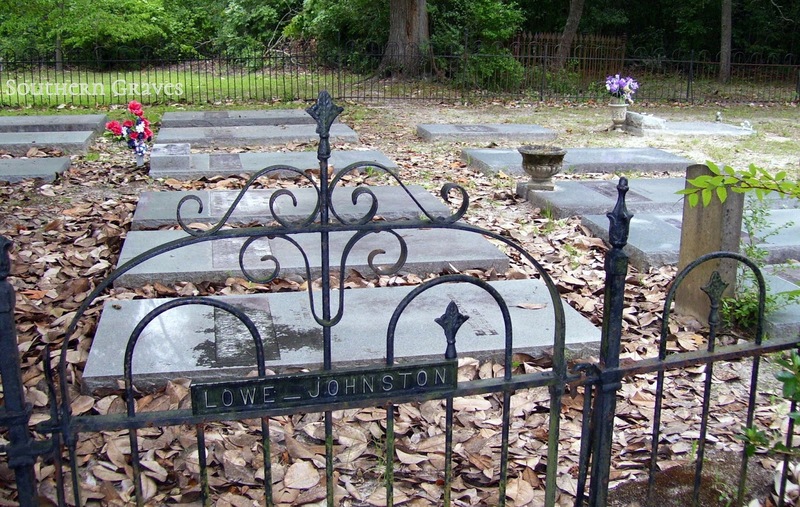 Thomas Lowe was born December 26, 1826, and died January 17, 1880 at his home in Bullard. He married Cornelia Ann Mims. She was born in Edgefield, South Carolina July 26, 1829, daughter of Martin and Charlsie Ferguson Mims. 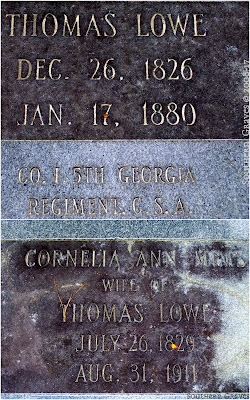 Some of Thomas and Cornelia's children are also buried in Beech Springs Cemetery. 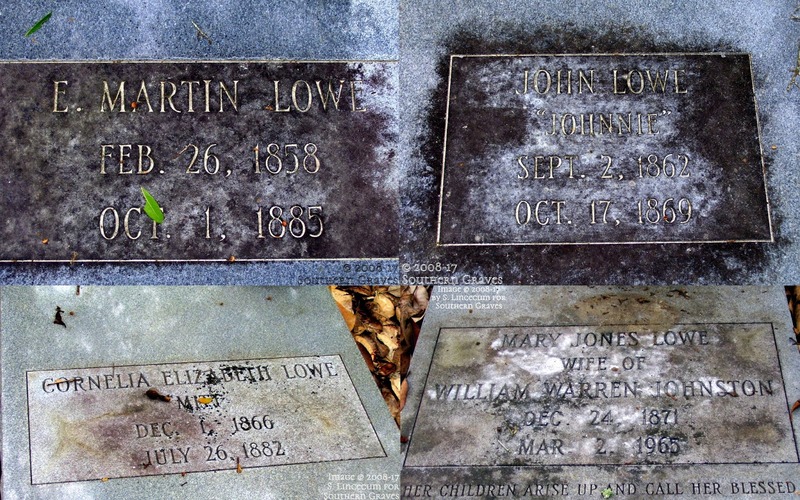 They include E. Martin, John "Johnnie", Cornelia Elizabeth "Mitt," and Mary Jones. I also came across an obituary for Cornelia Ann Mims Lowe. Interestingly enough, the death date on her gravestone might be incorrect. Mr. Jim Carroll posted a transcription of her obituary to the Twiggs County, GA GenWeb Archives and states it is from the Macon Daily Telegraph dated 30 August 1910. The death date on her stone is 1911. Mrs. Cornelia Lowe, widow of Thomas Lowe, died yesterday at the residence of W. W. Johnston, Bullards, GA at 1 o'clock. Mrs. Lowe has been a resident of Twiggs County for the past sixty years. She is survived by three children, Thomas Lowe of Gresston, GA; John M. Lowe of Bainbridge, and Mrs. W. W. Johnston, of Bullards, GA.
Mrs. Lowe was eighty-two years of age at the time of her death and was universally beloved by the community where she has so long been identified. The funeral services will be held at Beach Spring, at 12 noon Tuesday, Rev. A. S. Adams of Jeffersonville will conduct the service. Interment at Beach Spring Cemetery. I'd actually love to thank you for posting this... This tid-bit of info just told me where the plantation my family line came from. And will further help in my families never ending quest of finding out where we came from since most records have been lost. Since my ancestors took on his surname after slavery ended.. I'm now one step closer. Thank you. And I appreciate your comment. It helps me to know what I'm doing is a passion for a reason.